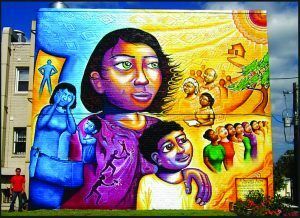 Joel Bergner’s A Survivor’s Journey: The Domestic Violence Awareness Mural depicts the journey of survivors of domestic abuse, leaving behind danger and pain, and looking with hope to the future. In 2000, the Women’s Crisis Center of Taney County received a grant through Presbyterian Women’s Birthday Offering. Established in 1990 in southwest Missouri, the Center provides shelter, support and advocacy for victims of domestic violence. Executive Director Becky Vermeire reports that by 1997, it had become obvious that they needed to expand their services to provide support to victims of sexual assault. In 2000, Becky applied for a Birthday Offering grant to help the Crisis Center build transitional housing. At the time, the area lacked affordable transitional housing. So when people who had experienced domestic violence needed to leave emergency housing, many had nowhere to go but back to abusive situations. Thanks in part to a $200,000 grant from PW’s Birthday Offering, the Crisis Center now has five transitional cottages (in addition to their 14 emergency shelter cottages). These residences provide shelter for up to 24 months for victims and families, as they work with the court system and social services to gain independence. Today, the Crisis Center provides quality residential and non-residential services to victims and survivors of domestic violence and sexual assault. It serves both women and men who are caught in abusive domestic situations, providing sexual assault crisis intervention and emergency shelter. Staff members work as advocates for people who have experienced domestic violence, standing with them as they work their way through the courts, support groups and legal assistance. Multilingual interpreters are available. They do all of this work on what Becky calls their “shoe-string budget”—that did not include funding specifically dedicated for victims of sexual assault until 2014. Last year, the Crisis Center provided emergency shelter (stays of less than 90 days) for 192 women, 2 men and 97 children; non-residential treatment for 252 women, 18 men and 183 children; and transitional housing for 6 women, 1 man and 6 children. Additionally, 433 victims participated in non-residential support groups. Becky lamented that for every one victim aided by the Crisis Center, two victims must be turned away due to limited shelter and funding. The Center operates with eight staff members and close to 200 volunteers (who provided an incredible 4200 hours of service in 2014). In addition to ongoing funding, Becky said the shelter continues to need items that are found in any home—from food and personal hygiene supplies to clothing and linens, appliances and furniture. She welcomes the support of area Presbyterian Women’s groups and cites receiving the Birthday Offering as a huge boost to their ability to serve the women, men and children in the community. Absence of Water—Thirst and Longing Scripture: Exodus 17:1-7 (Blog Inspiration) Have you ever spent time wandering in the wilderness of a desert?